NEWS FLASH, December 13: Susan Rice withdraws name from consideration—this article provides relevant background. As Barack Obama prepares to reshuffle his cabinet deck, a lot of attention has been focused on a person reportedly under consideration to replace Hillary Clinton as Secretary of State: Susan Rice. Currently ambassador to the United Nations, Rice is a brilliant, blunt career diplomat. It’s well worth the exercise of carefully studying what Milbank contends, because it tells us more about the prevailing “wisdom” than it does about Rice and her actual qualifications. In other words, one might credibly find Susan Rice very problematical—but not for the reasons her detractors cite. Even in a town that rewards sharp elbows and brusque personalities, Rice has managed to make an impressive array of enemies — on Capitol Hill, in Foggy Bottom and abroad. Clearly, not a “hail fellow well met” who is loved by legislator, policy mandarin and lobbyist alike! Milbank inadvertently suggests she’s a rare, fairly honest presence in a fishbowl full of two-faced piranhas. Particularly in comparison with the other person often mentioned for the job, Sen. John Kerry, she can be a most undiplomatic diplomat, and there likely aren’t enough Republican or Democratic votes in the Senate to confirm her. What’s the next problem with Rice? And? The problem there is? Clinton has often been sympathetic to aggressive war. Clinton got a measure of revenge in 2010 after she worked out a deal with the Russian foreign minister on a package of Iran sanctions to be adopted by the U.N. Security Council. The White House wanted Rice to make the announcement (part of a campaign to increase her profile that included high-visibility foreign trips and TV appearances), but a Clinton aide got Kerry to ask Clinton about the matter during an unrelated Senate hearing. More petty than anything—and not from Rice. Anyone who looks carefully at McCain can’t help but see his tendency to immerse himself in all kinds of grandstanding opportunities, without knowing or adding anything to the matter at hand. He also famously reverses himself constantly. For example, visiting Libya and practically hot-tubbing with Qaddafi, then cannon-balling to the front of the “hang Qaddafi” parade. When you read a column like Milbank’s, it’s worth keeping in mind the Washington Post’s longtime role as the voice of the military, and the giant mining, oil and other resource extraction companies who love the troops. Are McCain and Kerry the way Milbank would have us perceive them, some kind of foreign policy whiz kids? And are they fellows who fundamentally disagree on policy—but in a respectful way, while representing two sides of a reasonable debate? How ironic it is that the establishment is angry at Susan Rice for possible misstatements over what the US knew regarding the attack that led to the death of US ambassador to Libya Chris Stevens, and three other Americans. Whatever took place then—and that is still not clear—making misstatements about one incident should hardly be more troubling than advocating for wars and invasions for hidden reasons, and allowing the American people to be misled as to what is actually going on in a massive and bloody adventure such as Libya. Rice was instrumental in convincing Obama to launch NATO’s eight-month bombing campaign against Libya—but where do we see her being criticized for that? 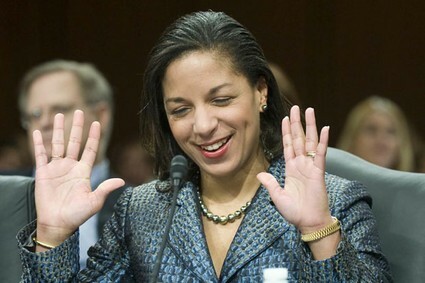 It was Rice’s own shoot-first tendency that caused her to be benched as a spokesman for the Obama campaign for a time in 2008. She unnerved European allies when she denounced as “counterproductive” and “self-defeating” the U.N. policy that Iran suspend its nuclear program before talks can begin. She criticized President George W. Bush and McCain because they “insisted” on it. But, as The Post’s Glenn Kessler pointed out at the time, European diplomats were rattled by such remarks because the precondition was their idea. Should we trust The Post’s assurances that the Iran “precondition” was really the Europeans’ idea? It’s the oldest trick in the book to get other countries, like Turkey with Syria and Qatar with Libya—out front to mask imperial calculations. Just ask that most reticent group, the “Coalition of the Willing,” that was muscled by the Bush Administration into feigning enthusiasm for the Iraq war. And should opposing the idea of preconditions prior to negotiations really constitute a black mark against a diplomat? How well have such preconditions worked out in the standoff between Israel and Palestine? Meanwhile, in all of this, there is scarcely any big-picture discussion about all the unnecessary, tragic wars we’ve seen prosecuted by the “heroes” in this saga, and more anger at this Rice than at another woman named Rice who served as Secretary of State, and today practically gets a free ride: Condoleezza, the friendly face of the Iraq deception and the tragedy that followed. Meanwhile, the Post piece reads like a straight hit from the Hillary Clinton camp. Beyond Milbank’s point that the Clintonites don’t like Rice for perceived transgressions and indignities, they probably also would prefer that Hillary not be followed by another woman who might outshine her in concrete diplomatic breakthroughs, of which there have been not so many thus far under Obama. After all, Hillary’s got a presidential race to run, which calls for plenty of image-burnishing, sharp elbows…and lots of assists from well-positioned pundits who tell us what to think and whom to like.